Are you having problems with your TV aerial? Is it damaged or broken? Perhaps you need a brand new aerial installed? Whatever you need, our TV aerial fitters in Manchester can carry out installations and repairs for our customers throughout Manchester! You'll find that our rates remain fiercely competitive but we never compromise on the quality of service that we provide all over the Manchester area. Call our team now for a free, no obligation estimate, and we'll happily provide you with one! 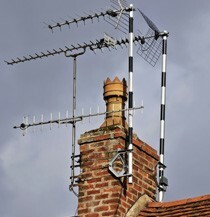 Get your aerials sorted in Manchester! Whatever the problem is with your aerials, one of our engineers can be right out to your Manchester home to put it right for you. We've got masses of experience in the trade and have a great reputation throughout the area, having provided our customers with outstanding service. If you'd like to find out more or to book our TV aerial fitters in, call us today on 0161 433 8292 and our friendly team will be able to deal with your enquiry.